The manual is a how-to guide and reference book for commercial fishermen who wish to bypass processors and wholesalers and sell their catch directly to brokers, restaurants and other buyers. Hard copies of the 5th edition of the manual, edited by Terry Johnson, are now available through Alaska Sea Grant’s online bookstore. The digital version is online on Alaska Sea Grant (www.alaskaseagrant.org) and Washington Sea Grant (www.wsg.washington.edu) websites. Direct marketing affords many opportunities, but it also involves risk. In addition to fishing, harvesters also take on the added duties of finding buyers, researching markets, advertising, shipping, dealing with regulations, and more. The Fishermen’s Direct Marketing Manual helps readers think through the myriad of issues so they can decide whether this business model is right for them. The manual also provides much of what they need to know to launch a new business or fine-tune an existing one. The new edition is packed with updated information on branding, product placement, social media, and emerging products. The manual also has new sections on accounting, insurance, digital marketing and commerce, and working with custom processors. 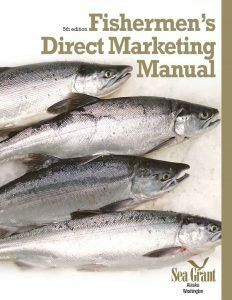 Fishermen’s Direct Marketing Manual is published by Alaska Sea Grant and Washington Sea Grant.